Silver Silence by Nalini Singh marks the start of another awesome paranormal series by the author that has all the spellbinding elements of her Bestselling Psy-Changeling series. This is Silver Merchant's story. Someone is trying to kill Silver and in turn, throw the fragile new world order into chaos but he/she doesn't know who they are dealing with. If you have read the Psy-Changeling series then you have already met Silver as Councillor Kaleb's assistant. I have always been intrigued with her character. She is icily silent, super efficient and seems heartless but with this book, the author gives the readers a deeper insight into this complex character's life and ideals. I had never been a fan of paranormal romance especially the steamy kind but after reading Nalini Singh's books, I have become a huge fan of her work and come to like this genre. Although this is the beginning of a new series still it takes after the Psy-Changeling books with the same world, crossover characters and storylines so although a standalone, I would suggest that you also read the Psy-Changeling books to better understand the Human-Psy-Changeling world and characters of this book. The plot is expertly conceived and executed and although this is a lengthy book, I stayed glued to my seat throughout and stayed up all night to finish it in one sitting! With a racy storyline, vivid scenes, expertly developed characters, multiple storylines that each succeed in touching your heart, suspense, mystery and intense romantic chemistry, I loved everything about Silver Silence and happily recommend it all readers above the age of eighteen. Definitely one of the better books of 2017, I cant wait to read the next one. 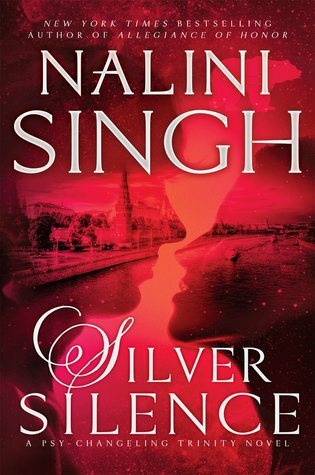 For now, 4.5 out of 5 to Silver Silence by Nalini Singh from me and if you haven't yet read the Psy-Changeling series, start now. I received an ARC from the publishers via Netgalley and I am very thankful to them. The above is my honest and unbiased opinion and in no way influenced.